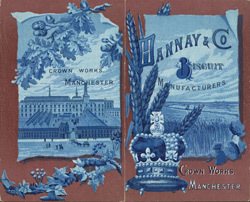 This leaflet is an advertisement for Hannay and Co, biscuit manufacturers. During the 19th century new machinery was developed that made the production of biscuits much easier and faster and encouraged manufactures to make more interesting and ‘fancy’ products. At the start of the century biscuit manufacturing was on a very small scale with local baker’s stores making small batches and treating them as a sideline to their main bread making business. Large scale mechanisation changed this and many of the jobs previously done by hand such as cutting and moulding, could be done by machine. This biscuit manufacturing company is based in Manchester and offers a variety of biscuit such as the Digestive, Iced Gems and Victoria Drops.